If obsession had a colour, it would be orange, KTM orange. 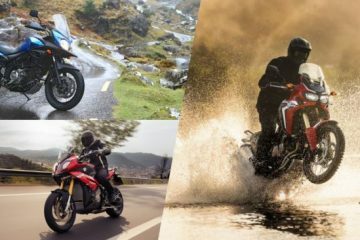 Beyond any other motorcycle manufacturer, the Austrian brand exhibits an unrivalled commitment to be at the top of its game in whichever sector it targets. 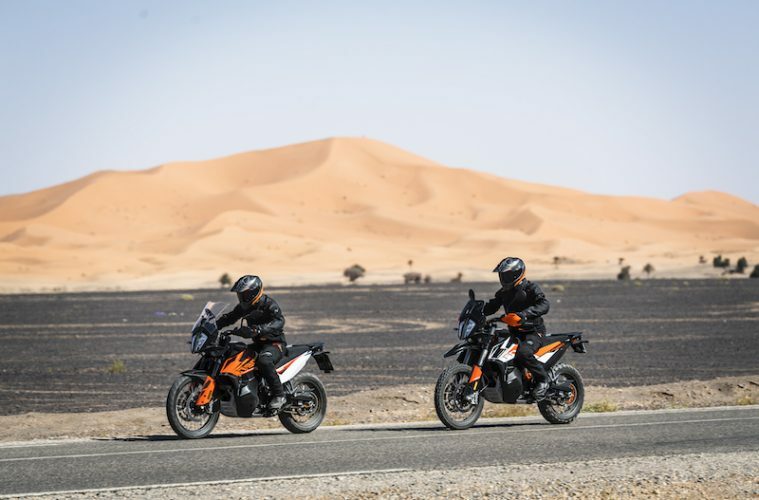 Although the development of the KTM 790 Adventure and Adventure R has taken place over the last four years, the obsession with making the definitive adventure bike goes right back to its first production model, the 620 Adventure back in 1997. 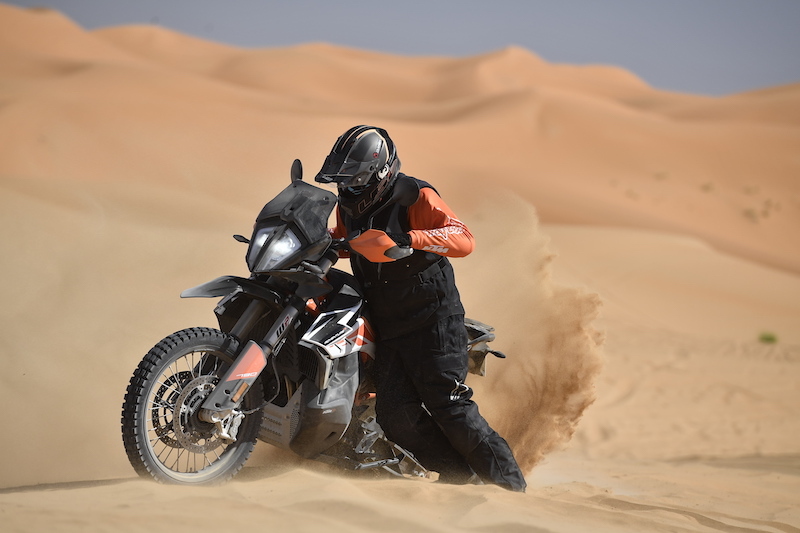 The lineage of the 2019 bike can be traced through the 950, the 990, the 1190 and the 1290 and is inextricably linked to the brand’s phenomenal success in the Dakar rally. This is a bike with some serious history behind it and a bike with massive expectations riding on it. 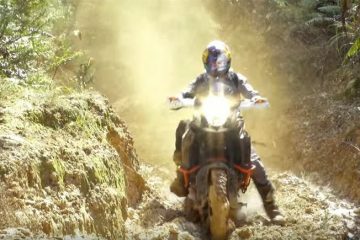 But to develop the new 790 Adventure and Adventure R, the guys at KTM didn’t just sit in Mattighofen and rely on their back catalogue and racing success to cobble together just another adventure bike. 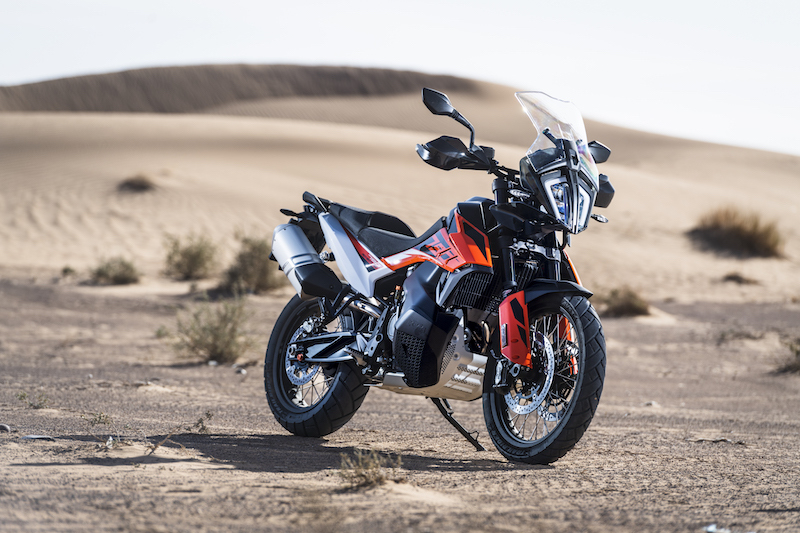 The core of the new KTM 790 Adventure platform is a new parallel twin engine, developed in tandem with the one for the 790 street bike, but with markedly different power characteristics to reflect the different requirements of an adventure travel bike. One of the main criteria was to make the engine compact in order to centralise the mass, keep the seat height low and keep the ground clearance high, just as the riders had asked. 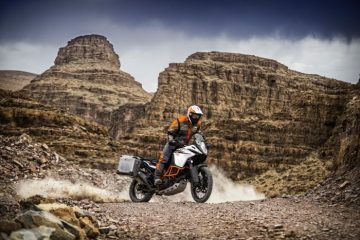 To further aid this process, KTM ditched its usual rally-style trellis frame and designed a completely new frame that uses the engine as a structural part, while bolting a more usual lattice-style subframe at the rear of the bike to cope with the demands of proper luggage carrying capacity. 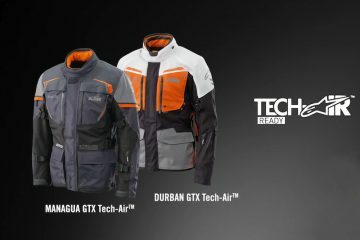 The bikes are packed with clever details, from the high air intake to the cassette air filter, the easily accessible battery compartment to the quick-release enduro style side panels that are perfect for tools and spares. The limited enduro bike-styled bodywork is all individually replaceable plastic components with sublimated graphics, so they won’t damage easily and, if they do, replacing them shouldn’t break the bank or the heart. Don’t think the 790 and 790 R are all about components stripped back to basics. The electronic controls range from cornering ABS to traction control, braking ABS to selectable riding modes, quick shifters and cruise control, all controlled through the modestly-sized but super-clear TFT screen at the front of the open enduro-style cockpit. 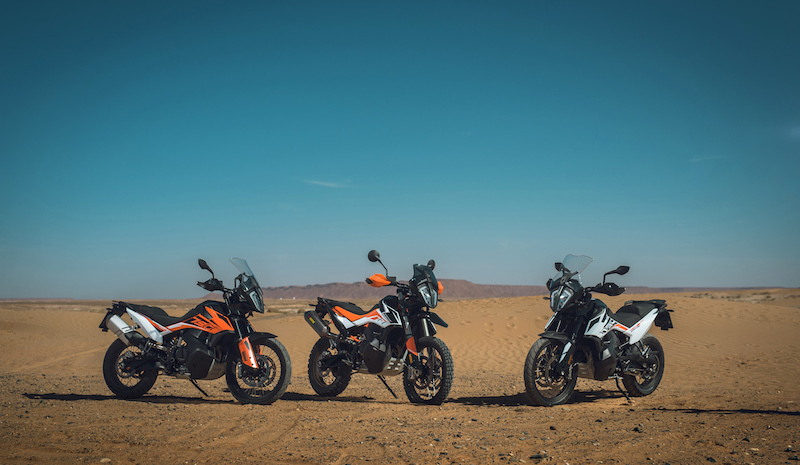 Both bikes have the same LED headlights and distinctive praying mantis face, but in standard trim, the Adventure has a taller adjustable screen whereas the more off-road focussed Adventure R version has the shorty tinted version. 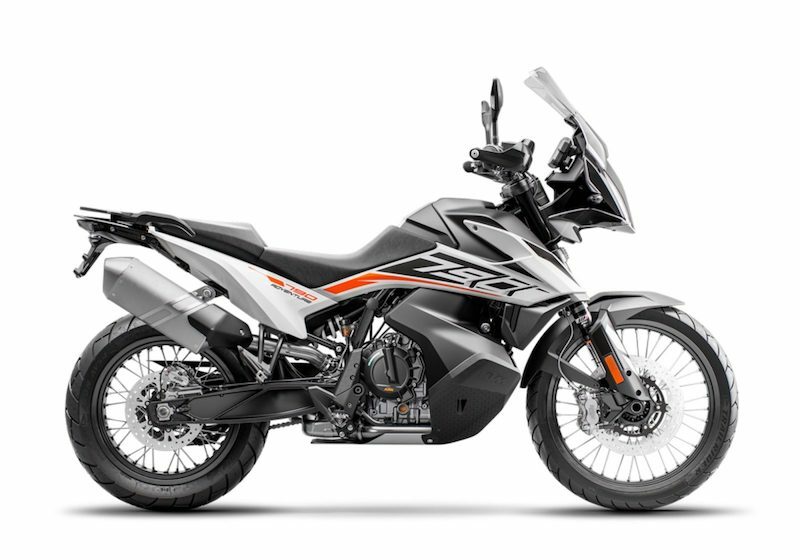 Similarly, the Adventure has the two-piece stepped, height-adjustable seat, while the R gets the one-piece unit, but in a way that only KTM manages, the parts can be interchanged between the models in seconds. What is clearly different between the bikes is the suspension. Both models have front and rear springers from WP, but the 790 Adventure has 43mm USD open cartridge WP Apex forks with adjustable separate fork function and a WP Apex shock at the rear operated through the familiar and simple PDS system – both set-ups giving a full 200 mm of travel. For the KTM 790 Adventure R the enduro spec 48 mm USD Xplor forks are fitted, again with separate fork function and quick adjustment of compression and rebound damping from dials on the fork caps. At the rear it’s an upgraded unit from the enduro range too, with the PDS system acting on an Xplor shock unit. 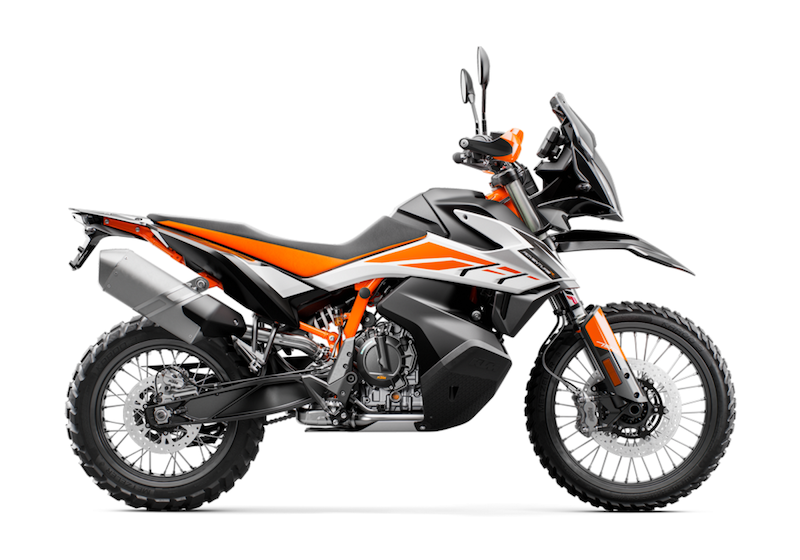 The 790 Adventure R has 40mm more available travel compared to the 790 Adventure with a massive 240 mm at both ends. The differences between the two bikes are marked and wholly intentional – these might look similar, but their intended market and use is apparently not. 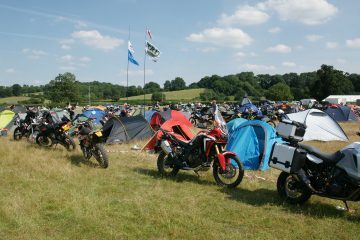 Are you an adventure rider that wants to go off-road, or an off-road rider that wants to go on adventures? 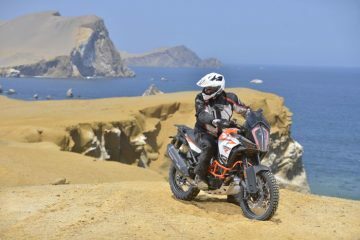 But all this clever technology, design and engineering would account for nothing if the 790 Adventure and Adventure R don’t meet the high standard that KTM, let alone the market, had set. Would it be as good as everyone had hoped? Was the four year wait really worth it? The answer is a resounding yes on every level you care to name. The motor is perfectly set up, the suspension is faultless, the design is practical and the balance, thanks to that short motor and the weird fuel tank, is far better than you would ever imagine. 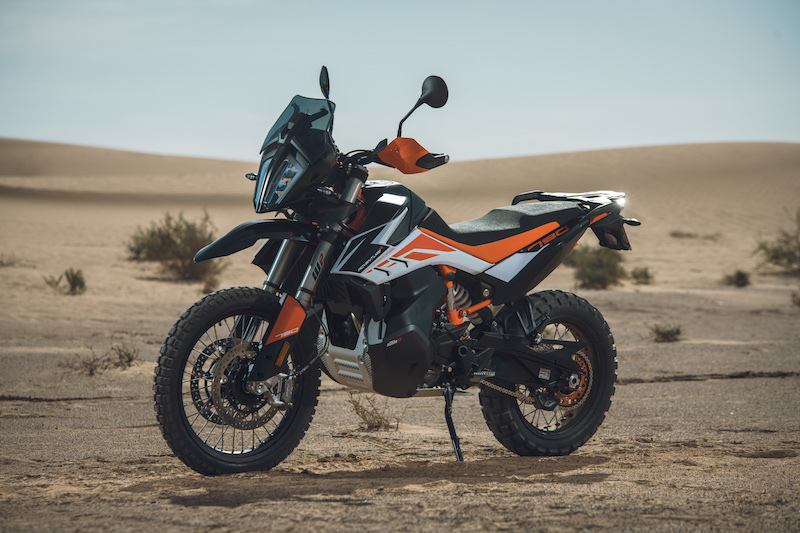 It’s easy to get caught up in the hype of a press launch, but for adventure riders that want to stray away from the black top, the 790, whether you choose the Adventure or Adventure R, represents a quantum leap in both design and performance. This is the 1981 Suzuki RM 125X. This is the first Fireblade in 1992. This is a truly impressive motorcycle. Julian has been writing articles and features for predominantly motocross titles since 2005. He was deputy editor at MOTO magazine before returning to freelance work, while he now tests motorcycles for Adventure Bike Rider. 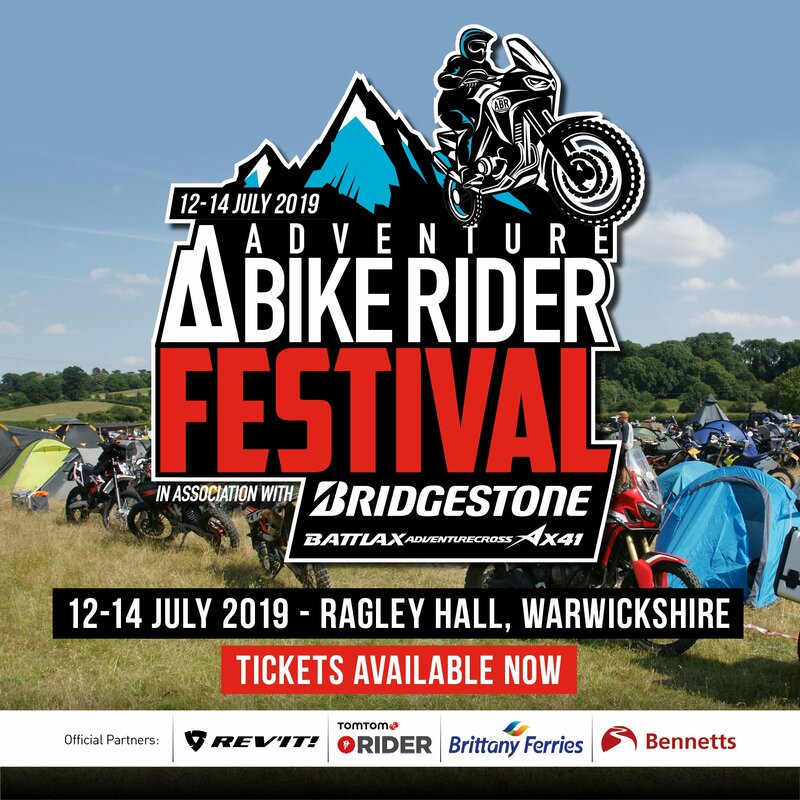 He's ridden since age eight and his current bikes are two KTM EXC250s (2001 and 2013), a 2007 Fireblade, a 1995 Yamaha TDM850, and a Yamaha XT660Z Tenere. He also collects clocks from the 1950s.